With Summer on it’s way, it’s time to shake up our make up techniques and learn how to create the perfect healthy glow for our clients (…and let’s not forget ourselves!) Our blog this week covers some incredible top tips & product picks from our Expert team of Make Up Tutors who have vast experience within the industry and keep their fingers on the pulse with the latest make up trends. Top Tips & Product Picks to Create the Perfect “Just Back From Holiday’ Glow Everyday! Apply an amazing illuminator for a beautiful Hollywood shimmer. We absolutely love Iconic London Illuminators! Always apply a great primer to ensure longevity and make up that lasts all night! Primer helps make up to sit correctly and avoids smudging and make up transfer and creasing. We love MAC Illuminating Strobe Cream for that radiant but natural dewy look. A full coverage foundation applied using a beauty blender and stippling technique ensures the foundation is buffed into the top layer of the skin, finished with powder for an ultra long lasting effect and a totally flawless finish. We love Mac Studiofix Fluid and Charlotte Tilbury’s Airbrush Flawless Finish Micro Powder. Widen and brighten the eyes with big lashes & bold liner! Gel liner and soft doll lashes give a glamorous, wide awake pop to the eyes and really lift an entire make up look. Finish with lashings of mascara to help give a seamless join between natural lashes and strip lashes for an “are they or aren’t they real?” appeal to eyes. We adore strip lashes and lash adhesive by El dora. Urban Decay All Nighters is the liner you need and we highly recommend Max Factor’s False Lash Effect Mascara to complete the look. Highlighter – an absolute must-have! Apply under the brow bone, top of cheek bones and the centre of the face (chin, Cupid’s bow and nose) to ensure the face is taken from a flat finish to a beauty 3D glowing finish that really enhances your facial features. Charlotte Tilbury’s Film Start Killer Cheekbones highlighter is exactly what you need to achieve incredible results! Always add sparkle, it simply must be done! Metallic or shimmer eyeshadows, high shine lip gloss and a finishing spray with shine completes a going out glam look. For va-va voom to the eyes consider Charlotte Tilbury’s Luxury Palette in Vintage Vamp. For glossy lips try Lip Lustre in Ibiza Nights. Want to develop greater confidence in your make up techniques? Looking to begin working as a Freelance Make Up Artist? Our fully Accredited Make Up Artistry training courses are a great way to learn the skills to gain insurance and begin earning up £100 an hour as an Make Up Artist. Turn your love of make up into your own successful business! 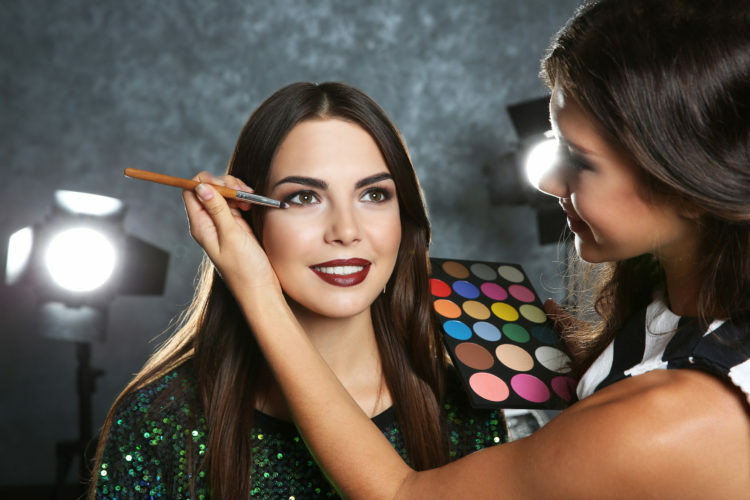 We’re passionate about Make Up at The Beauty Academy and provide Accredited Fast Track Make Up training courses & qualifications across our 9 training centres & also have an Online Make Up Course that can be studied anytime, anywhere to suit you! Learn more by browsing some of our Recommended Course options above or click below to get in touch & discuss the best training option for you!